Next month's In Practice column will illustrate how neurologists are using voice recognition in their practices. 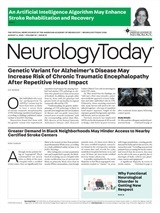 Last May, this column discussed how neurologists are benefiting from electronic medical records (EMR) in their medical practices. But one year later, we have learned that EMR adoption has fallen short of its promise, with fewer than 10 percent of physicians switching over from manual charting. Why have so many of us been so slow to implement this technology to eliminate manual charting? Interviews with neurologists who had expressed interest in EMR systems revealed that there are still obstacles to overcome: among them, systemic problems, cost, and poor vendor support. Randolph W. Evans, MD, a neurologist in solo practice in Houston, TX, and President of the Harris County Neurological Society, has been looking for an EMR system for several years but has not found one that meets his needs. Like others interviewed here, he said most systems are too generic for his practice. Indeed, Dr. Domingue's quest for a better system spurred his interest in taking computer programming courses so he could design his own applications that generate EMG and toxin reports. He eventually obtained a master's degree in computer science. And even if a suitable program is found, most neurologists report that current products – which run from the tens to even the hundreds of thousands of dollars – are just too expensive. But Laurence Haber, MD, who is part of group practice in Manhasset, NY, said he thinks such a product would be worth the investment. “I would be willing to spend extra if it meant never having to search for a lost chart or needing to weed through piles and piles of paper reports,” he said. Still, he has not yet found a program that is fully integrated with billing and compatible with external reports. He hopes that his hospital, which is looking into an EMR program, will somehow make it accessible and affordable to community physicians such as himself. Last December, the American Academy of Family Physicians (AAFP) received the green light to further develop an Open Source Electronic Health Record (EHR). The product tackles several of the obstacles that AAN members described. It is low cost and free of licensing fees (addressing the issue of expense), allows for customizable input for specialty-specific documentation (addressing content and workflow issues), supports seamless exchange of clinical data between health care providers and institutions, and is consistent with standards and regulations(supporting the data portability and cross-institutional issues). He also welcomes neurologists' input and experience with regard to best practices and the linkage of evidence-based clinical information for use by primary care clinicians, patients, and other non-neurologists. “The Open Source EHR is truly‘open’ to ideas as to the best means of secure communications between primary doctors and subspecialists, and its leaders would like to see new channels of information flow for referrals and follow-up become easier to use as a result of this technology,” he said. Neil Busis, MD, a neurologist in private practice in Pittsburgh, PA, and a member of the MEM subcommittee, is waiting to see how his hospital's EMR project turns out before he buys one of his own. Despite obstacles, there is clearly interest in continued development of new technologies to improve practice efficiency. Whether more neurologists will continue to experiment with the next generation of EMR systems remains to be seen.